I've been working with different aspects of computers and computer graphics for 20+ years. I've worked (and continue to work) on political campaigns, working as technical support for web and office computing needs as well as web designer. The basic resume theme: C and Unix and things related. I enjoy designing and writing high-performance, highly-available code for transaction processing, communication, and interacting with hardware devices. I'm picky about making clean, indented, readable, and commented code. Compared to most programmers I do a very good job writing coherent English. I like making useful, intuitive user interfaces. Pick A Format To Download Plain Chronological Resume Plain Resume (slightly condensed) Chronological Resume Including Other "Work"
A senior-level software engineering position with a progressive and dynamic company that appreciates dedication to quality software solutions and technical achievement. Sparcstations, Sun servers, desktop and embedded PCs, microVAX II, IBM mainframes, DECstations, AT&T 3B2, Eaton 2000 IWS. Designed, created, and tested enhancements to a high-performance OLTP client/server system processing domestic and international financial transactions. Designed, created, tested and implemented solutions to convert third-party account data into the format native to the financial transaction database. Designed, created, tested and maintained robust suites of client/server communication processes and software interfaces to hardware devices that manage manufacturing of medical devices by enforcing lot and safety controls in a industrial environment. Created and tested software for embedded environments to provide user interfaces and communications with external hardware in hand-held PC and data collection terminals. Specifically chosen as the developer for in-house and customer solutions to problems of interfacing to hardware and situations that require efficient and reliable code. My commitment to thorough planning and testing resulted in software suites that run for months in an industrial environment without errors and anticipate potential problems caused by end users. My ability to maintain a grasp on the technical requirements to solve problems while communicating effectively verbally and in writing with non-technical end users produces finished products that behave reliably, predictably, and intuitively for users. Currently participating in teams designing, coding, testing, and implementing new features and corrective maintenance updates in the high-performance OLTP financial application managing ValueLink gift card accounts. The OLTP system runs on Solaris and is implemented as multiple instances of several programs written in Oracle PRO/C that use sockets, shared memory, semaphores, condition variables, etc. The communication architecture services transactions from over 180,000 merchant locations. The database services tens of millions of gift card accounts belonging to over a hundred high profile merchants. Designed, coded, and tested a new process enabling the OLTP system to collect daily foreign currency exchange rates from a server on the Internet and perform real-time currency conversion on transactions. This project is implemented using Oracle PRO/C executables, Unix shell scripts, crontabs, Perl scripts, and Oracle PL/SQL stored procedures. Designed, coded, tested and implemented processes to port foreign account information into the OLTP database and allowing these foreign merchants' data to be processed as native accounts. Current job duties also include performing technical support and analysis of high-visibility, time-critical issues on the production servers. My knowledge of the underlying Unix IPC mechanisms in the OLTP system and commitment to error-free solutions frequently gives me the responsibility of creating tools for other developers to monitor and analyze the data being processed through the OLTP system. This includes: a tool to dissect the contents of OLTP transactions supplied in various text and binary formats, a library allowing external processes to monitor the real-time processing, heart-beat, and checkpoint events in the currently executing OLTP applications, and a tool to compare the contents of database objects stored in shared memory. Added features and fixed bugs in AutoTime, a large commercial time and attendance management software package. Performed a variety of testing and maintenance on our client, server, reports, and some work on the GUI: Client data collection software operated on industrial DOS PC terminals, used a TCP/IP interface to the database server, and was built using Borland C/C++ 4.5 for DOS. The background database server ran on Sun, HP, or Windows platforms for Oracle and was written in C++. GUI configuration and management software ran on Windows using a Delphi 3 GUI, generated reports using Crystal Reports 8.0, and executed back-end communications with the server using code written in Microsoft Visual C++ 6.0. Designed and wrote the original data collection terminal’s user interface software for presenting menus and collecting data. Also added new features to the terminals for communication with external hardware such as bar code scanners and label printers (Zebra Stripe). Ported several Crystal reports to Oracle PRO/C to run on Unix as a special project for a specific client. SunOS, HP/UX, Oracle PRO/C, asst. industrial hardware peripherals. Added features and fixed bugs in AutoTrak/AutoShip, a large commercial shipping and inventory management software package. The program was written in Visual C++ 5.0 with a GUI primarily created in ProtoGen (and some MFC dialogs). The program used the Oracle or Informix databases and generated reports using Crystal Reports 6.0. Some of the back-end database processing was duplicated in Oracle PRO/C to run as Unix processes. Added new features for communication with special industry hardware (scales, conveyor lane controls, scanners, and label printers). Wrote the user interface software for remote, RF hand-held data collection terminals (Telxon PTC960.) Added background processes written in Oracle PRO/C for Unix platforms to load and validate shipping information in the database. Embedded PCs, assorted industrial hardware controllers and peripherals: ci scanners, Sato, imaje, Fargo, and Zebra printers, Allen Bradley PLCs, Telxon RF terminals, microAnnex Ethernet-serial interfaces. Worked with a team of developers sharing duties to design, write, test and maintain robust suites of software used to manage manufacturing on Vistakon’s First Generation Surevue and Accuvue contact lens production lines in Jacksonville, FL. Designed, wrote, tested, fielded, and maintained a significant part of the data processing support of the Vistakon manufacturing environment: A single production line uses multiple servers running SCO Unix that store data in Informix databases. Some programs providing terminal displays (Wyse60 and Telxon PTC960 hand-held RF terminals) were written in Informix 4GL while others were written in Informix Embedded SQL/C (esql/C) and generate their displays using curses. Many programs were background communication processes written in esql/C to provide interfaces to a variety of industrial hardware devices, exchange information with other processes, and store information in the Informix database. Some code was in proprietary languages executed in embedded environments; for example, Computer Identics scanners and terminals contain code written in TAL. Special assignments included maintenance on a program written by outside contractors in QuickStep for a Control Technology Corporation 2200 Automation Controller. Wrote C code to communicate with the following devices: ci240, and ci max 7500 scanners (with ci10/ci15 scan heads) via Starnode, and also Allen Bradley PLC-5/10, PLC-5/15 using the Allen Bradley Data Highway, and a PLC-5/40e via TCP on Ethernet. Also, wrote programs managing various label printers (Sato 8400/8450, Fargo, Zebra, and imaje) communicating via serial ports or TCP on Ethernet through microAnnex XLS interfaces. Also specifically responsible for maintaining and writing test programs to validate our library of common code for reading configuration settings from files, providing local IPC services via named pipes, and communication via serial, Allen Bradley Data Highway, UDP, and TCP interfaces. Added new features and fixed existing bugs in a prototype application for Ryder that managed fueling operations for their rental trucks. The application ran on a Telxon hand-held DOS PC and was written in C. The program uploaded collected data to other computers via serial protocols. Wrote new modules that interfaced the Telxon hand held PCs to external hardware: Dallas Semiconductor memory buttons, scanners, and thermal printers. Added new features and fixed existing bugs in software used by the customer service personnel answering phone calls from cardholders. The software was written in C and ran on Sun Unix systems presenting an OpenLook user interface that retrieved data from an internally developed, proprietary database interface. Added features to the billing statements printed on postscript printers. Repaired inconsistencies in the applications’ OpenLook GUI. Developed an in-house OpenLook application to manage status reports and generate reports to postscript printers. Amiga/Video Toaster, Industrial VTRs, TBCs, and edit controllers. Part-time operator and co-owner of a video production studio. Designed 3D animations for flying logo advertisings. Performed a variety of graphics and image manipulation activities for videos edited in the studio. Developed tools in C and used the interprocess communications facilities of ARexx to build super-applications to perform automated image processing and control industrial video and audio equipment. In 1996 I worked on a contract for the Defense Intelligence Agency to produce 3D renderings of earth topography in support of troops deployed in the Middle East. Ported existing mainframe terminal applications for the USAF Intelligence Office on Ramstein AB, GE to a Unix workstation/GUI environment as part of a team of five programmer/analysts. The original programs were written in Model 204 on IBM 3081s using character-based terminals. The ported programs were written in C for DECstations running Ultrix using Motif user interfaces built in UIL. The team added a plethora of new features at the request of the intelligence analysts to take advantage of the GUI environment. Responsible for managing user interface consistency across multiple applications. Wrote code utilizing the X Window API to solve low-level graphics problems and wrote code for interprocess communication to connect several applications. Handled the optimization of code doing long-running computations. In charge of technical support and training the users of PC class workstations on a government version of the Internet approved for handling Secret level classified information. Installed and configured hardware and software at sites on the network across all of the European theater. Trained new users how to operate the computers and use the Internet software. Wrote utility programs in C for DOS PCs and VMS equipped MicroVAXes. Wrote applications for the intelligence analysts of HQ United States Air Forces in Europe. The programs were written for IBM 3081/4341 mainframes in Model 204, COBOL, and Fortran. Also wrote small utility programs in C for a proprietary workstation (Eaton 2000 IWS) using Unix with a proprietary GKS-like graphics environment, and also for AT&T workstations running Unix. 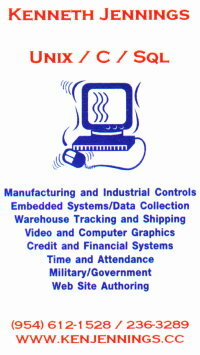 Graduated from Computer Systems Technical Training courses with an Honor Graduate Certificate representing an average grade over 96% through the entire course. Classes were eight hour days, five days per week covering COBOL, Fortran, Assembly Language, Networks and Communication Protocols, and System Management.